I learned how to make slice cookies when I started my “cookie baking”. Many of these recipes might be titled “refrigerator cookies” or “icebox cookies”. I differentiate among these three names because “slice cookies” have one unique feature to me. Refrigerator and icebox are basically the same. Icebox is simply the old time name for a refrigerator which was kept cold with ice instead of electricity. Even though all three of these “named” recipes require refrigeration, there is a big difference with the slice cookies. After mixing sliced cookie dough and placing in the refrigerator, the mess ends. 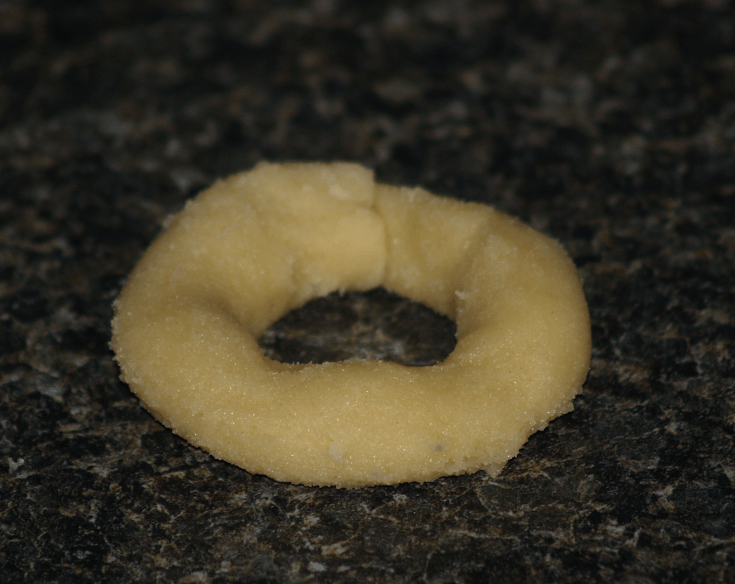 With refrigerator or icebox cookies, rolling or some kind of shaping is required. This might require using more flour and sugar and require more cleaning. If you are learning how to make slice cookies, they can simply be sliced on a cutting board and baked with no mess. This is a very speedy process. If you want to learn how to make slice cookies for a special occasion, the time is often very valuable. 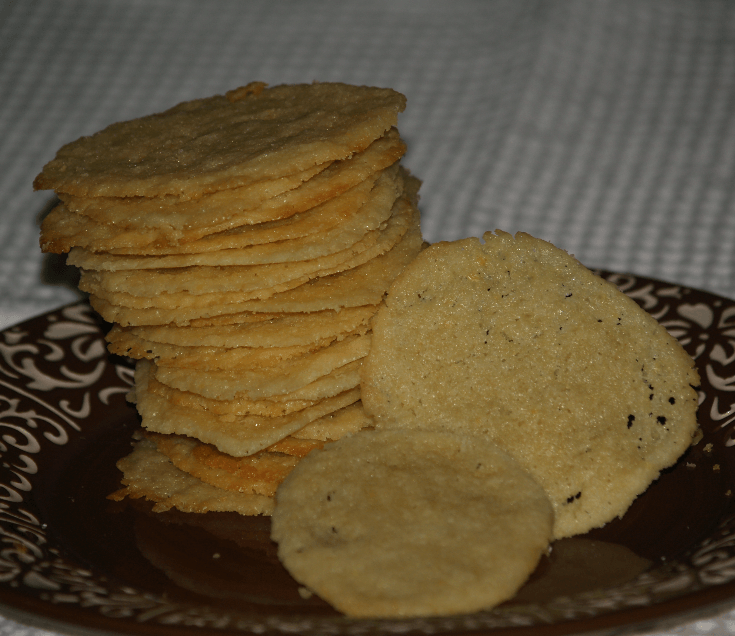 I was really surprised at all the various types of these cookie recipes which I had collected. Several recipes of different flavors can be prepared ahead of time and quickly baked when needed. If you want to spend more time on them, they can be shaped for the occasion. You can also add icing, chocolate or colored sugar to make a great presentation. It is essential to REFRIGERATE slice cookies to firm up the dough for slicing. You can ADD FLAVOR, TEXTURE and PRETTY EDGING on the logs with ingredients like chopped nuts, shredded coconut and coarse colored sugar granules. As you slice the cookies, give the log an occasional QUARTER TURN to prevent flattening on one side. This is one of the first recipes I used when I learned how to make slice cookies. I like it because you can change the flavors as you will see listed below the recipe. Combine and blend all ingredients in mixing bowl on low speed of mixer. Shape dough into a 12 inch long roll; wrap and chill at least 2 hours. Cut into ¼ inch slices; place on ungreased cookie sheets. Bake 7 to 10 minutes until light golden brown. Cool completely; decorate if desired. 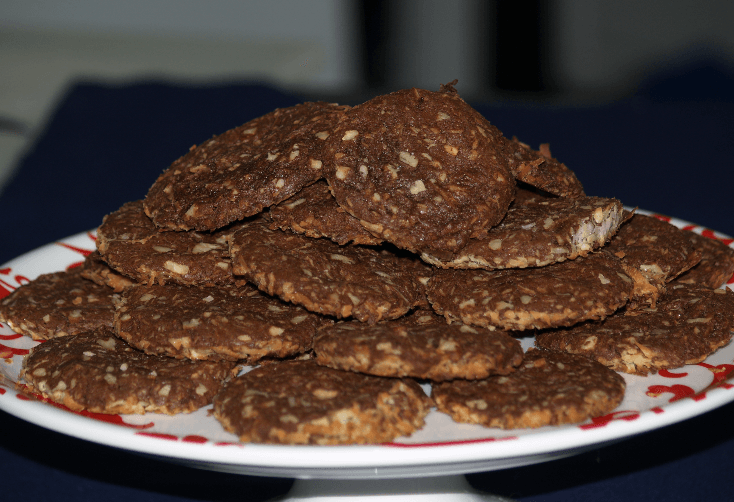 ORANGE NUT COOKIES: Add 2 teaspoons grated orange rind and 1 cup chopped pecans. 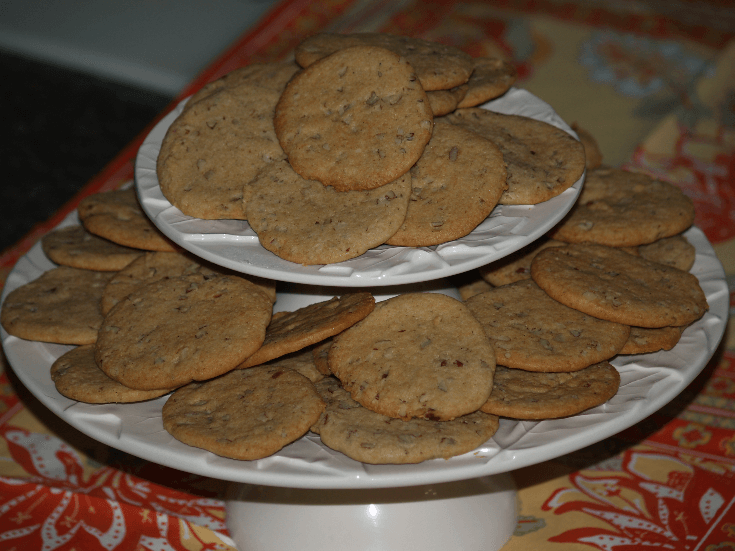 BUTTER PECAN COOKIES: Stir in 1 cup toasted salted pecan halves. 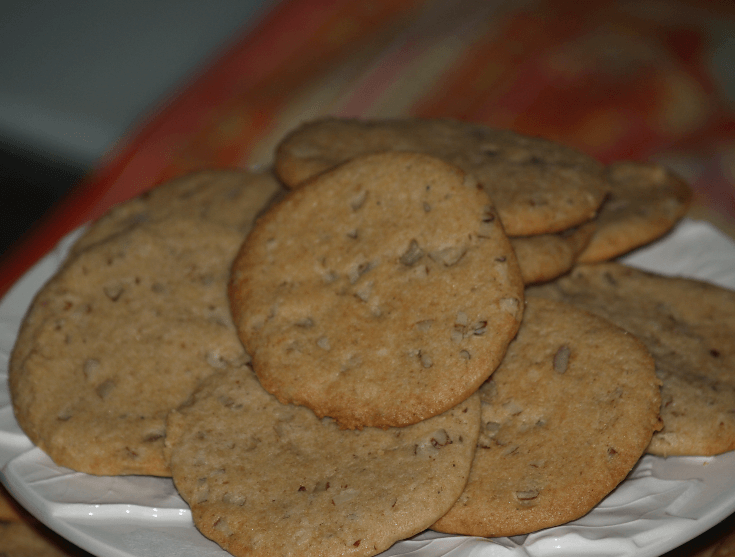 MAPLE WALNUT COOKIES: Substitute brown sugar for granulated in recipe. Add ¼ teaspoon maple flavoring and ½ cup chopped walnuts. 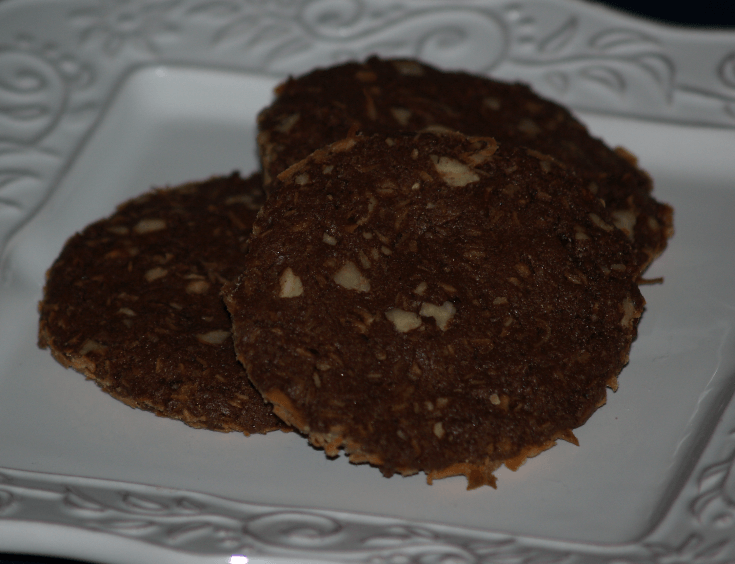 CHOCOLATE COOKIES: Omit milk and add 2 envelopes (2 ounces) premelted unsweetened chocolate and 1 cup chopped toasted almonds. 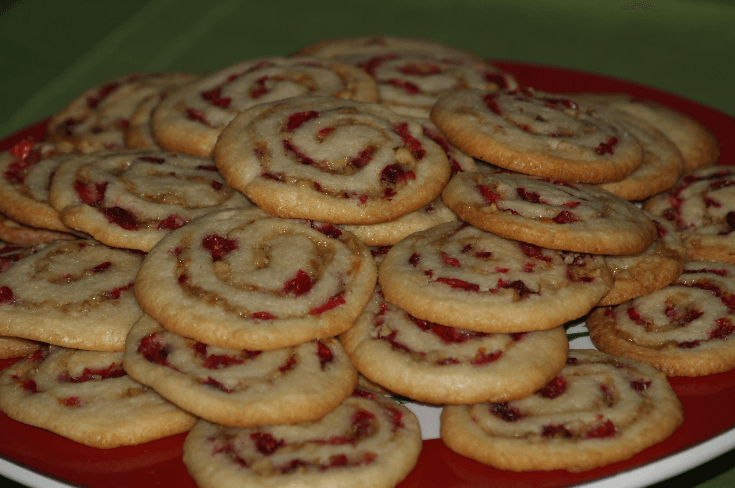 CHERRY NUT COOKIES: Add ½ cup chopped well drained maraschino cherries and ½ cup chopped nuts. CHINESE ALMOND COOKIES: Omit egg and vanilla. Add can (8 ounces) almond paste. NOTE: Work dough with hands until well blended. Top each cookie with an almond before baking. CRISP OATMEAL COOKIES: Substitute brown sugar for the granulated sugar. Add ½ cup quick cooking rolled oats and ½ cup chopped nuts. 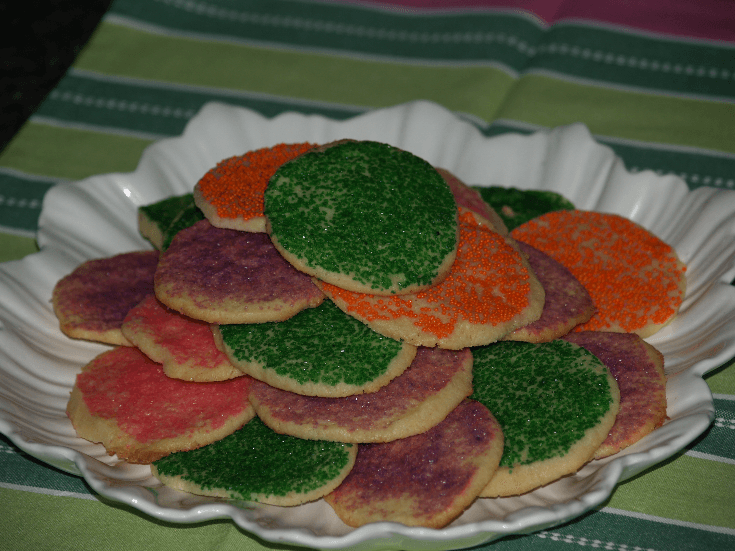 SUGAR COOKIES: Pour colored decorating sugar into a small bowl. Dip one side of the cookie into the colored sugar before baking. 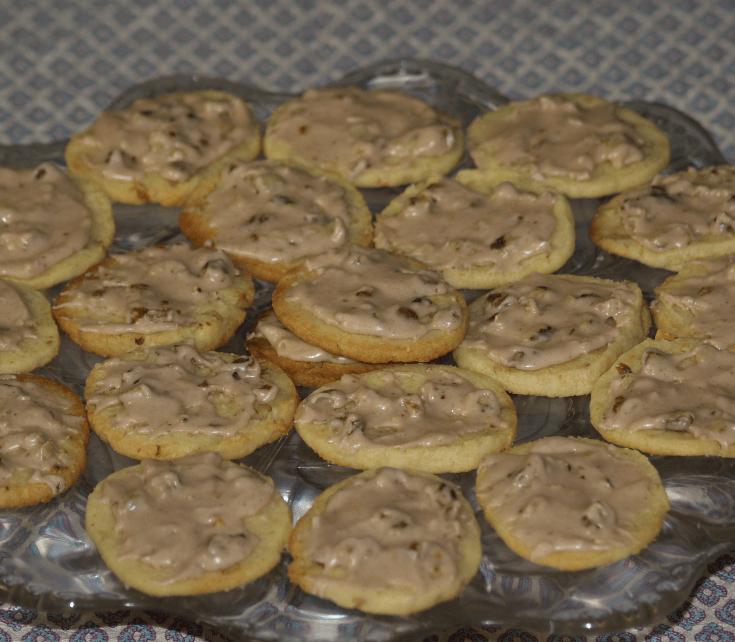 FROSTED COOKIES: Top baked cookies immediately with 3 or 4 chocolate, butterscotch or peanut butter chips. After 1 minute spread with a knife. HOLIDAY COOKIES: Cut dough into ¼ inch slices; cut again with small cookie cutters. Take dough trimmings and reshape into roll; refrigerate and slice more cookies. ALSO USE FOR COOKIE CRUST: Grease and sugar 9 inch pie plate. Cut 1/8 inch slices and line pie plate overlapping slightly to form a scallop edge. Flatten slightly to form a smooth crust. Bake at 350F degrees for 15 to 20 minutes until golden brown. Cool and fill. Great for no bake cheesecake and pies. NOTE: Homemade sliced cookies are so delicious in flavor due to our ingredients like butter. If you are just learning how to make slice cookies, sometimes because of these ingredients like butter, shapes do not hold as well. The Pillsbury company recommends to use their slice 'n' bake cookies. When learning how to make slice cookies using Pillsbury dough read the following tips. The instructions say to cut in 1/8 inch thickness, cut in desired shapes and bake on ungreased cookie sheets. Bake at 375F degrees as directed on the package. Cool the cookies 2 minutes and then remove with a spatula to cool completely. Use Pillsbury Frosting to frost cookies. 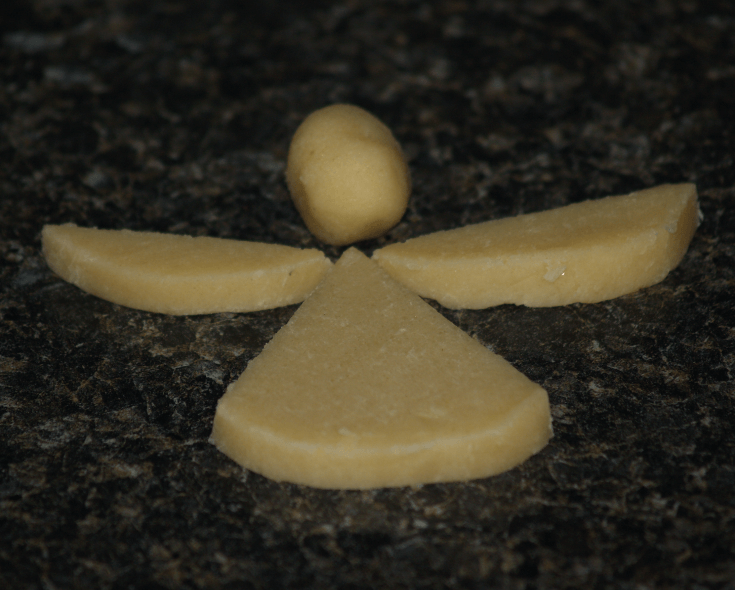 CHRISTMAS ANGELS: Cut a narrow strip from 2 sides of cookie leaving a triangular piece for the body. Place the cut pieces at the sides for wings. Make a ball from ¼ of another cookie slice for the head. Arrange small cake decorations for the eyes. Bake and cook; decorate with frosting. Makes 48 to 60. CANDY CANES: Roll 1 slice into a pencil like strip 5 inches long. Shape into a cane. Bake and cool. Frost and decorate with red cinnamon candies: makes 60 to 72. HOLLY WREATHS: Roll 1 slice into pencil like strip 5 inches long. Shape into a circle; bake and cool. Decorate with frosting and red cinnamon candies. Makes 60 to 72. CHRISTMAS TREES: Arrange 4 half slices to form branches, 1 half slice for the base and ¼ slice for the top. Bake and cool. Frost with green frosting and decorate with small candies. Makes about 24. SANTA: Cut a narrow strip from 2 sides of cookie slice leaving a triangular piece. Place triangle above a whole cookie for the hat. Place the 2 narrow strips near the bottom of the whole slice for the whiskers. Sprinkle the hot with red sugar. Make eyes with chocolate pieces and the mouth with red cinnamon candy. Bake and cool; decorate with frosting; makes about 36. POINSETTIAS: Arrange 5 half slices with points together; straight edges facing the same directions. Bake and cool. Outline edges of petals with frosting; makes about 30. CANDLES: Cut a slice into thirds using the center piece for the candle stick. Place a rounded third for the base. Cut a narrow strip from the rounded edge of the another third and use for the flame. Roll remaining dough into a ball and use for the handle. Bake and cool; decorate with frosting. Makes 60 to 72. HALLOWEEN WITCH: Use 2 slices; cut narrow strip from 2 sides of 1 slice to form hair and triangle hat. Roll second slice into a ball to form the head. Place narrow strips curved edges in about ¼ inch from sides of head to form hair. Crimp triangular piece at bottom to form brim of hat. Place hat above head with edges touching. PUMPKIN: Use 1 slice ½ inch thick. Cut a small pie shape wedge out of slice to form stem of pumpkin. Push slice together to form whole slice where the wedge was removed. Place wedge pointed end out at top of the slice to form the stem. CAT: Use 2 slices. Cut bottom 1/3 slice from one slice. Roll remaining 2/3 of slice to form a head. Cut a small wedge from second slice to form a tail. Push dough together to form a slice where the wedge was removed for the body. Place ball above the slice to form head and body. Cut the 1/3 of the slice into 2 equal pieces. Attach to head to shape pointed ears. Attach wedge to 1 side of the body to form the tail. TURKEY: Roll a heaping tablespoon of the dough into a ball; flatten slightly. Roll 3 tablespoons of the dough into 3 oblong balls and place ¼ inch apart for the feathers. Using 1 teaspoon of dough shape 2/3 for the head and 1/3 for the feet. Combine and blend first 5 ingredients; set aside. Cream butter and sugars in a large mixing bowl; blend in vanilla and lemon extracts. Add dry ingredients to creamed mixture; blend well and stir in pecans. Divide dough into 4 parts; shape each into 1 ½ X 11 inch rolls. Wrap rolls in foil and chill overnight. Bake on ungreased cookie sheets about 10 minutes. NOTE: Has a great butter taste but does not hold shape well. Combine thoroughly the flour, sugar and butter. Add the yolk and flavoring; mix well. Roll dough into a log 2 inches in diameter. Wrap in wax paper and refrigerate several hours. Cut log in half lengthwise; cut each into 1/8 inch slices. Bake on ungreased cookie sheets for 8 minutes. Combine flour, pecans, cocoa powder and baking soda in small bowl; set aside. Beat with mixer sugar and butter in a large mixing bowl until well blended. 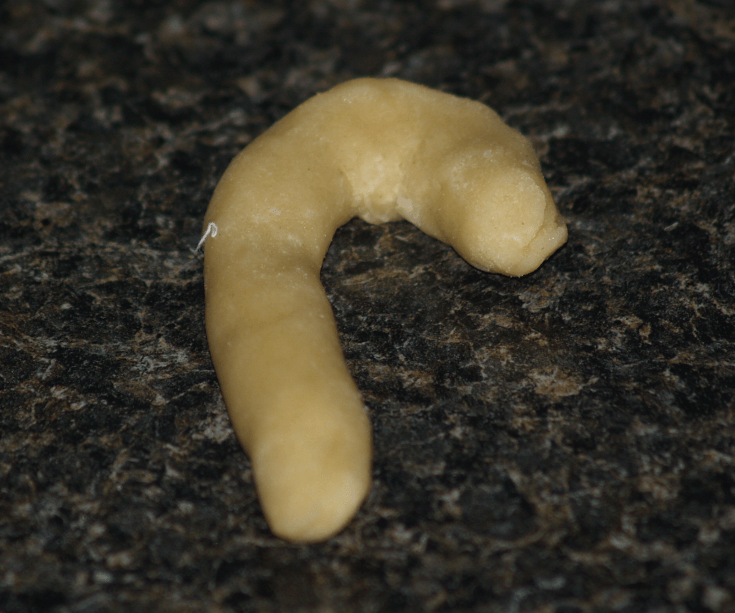 Beat in egg and vanilla; stir in flour mixer until stiff dough forms. Sprinkle coconut onto a work surface; divide dough into 4 parts. Shape each part of dough into logs 1 ½ inches in diameter. 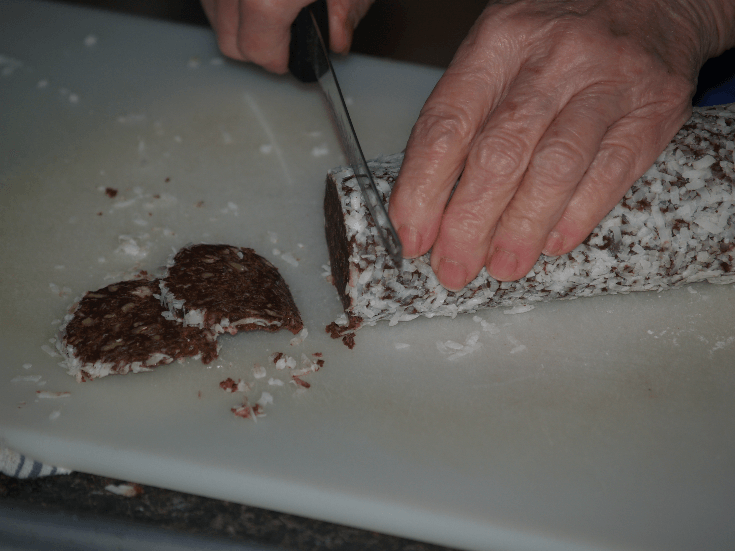 Roll logs in coconut until thickly covered; wrap logs in plastic wrap. Refrigerate for several hours or up to 2 weeks. PREHEAT OVEN to 350F degrees; line cookie sheets with parchment paper. Cut logs into 1/8 inch thick slices; place on parchment paper. Bake 10 to 12 minutes until firm and lightly browned. Cool on rack; makes about 36. 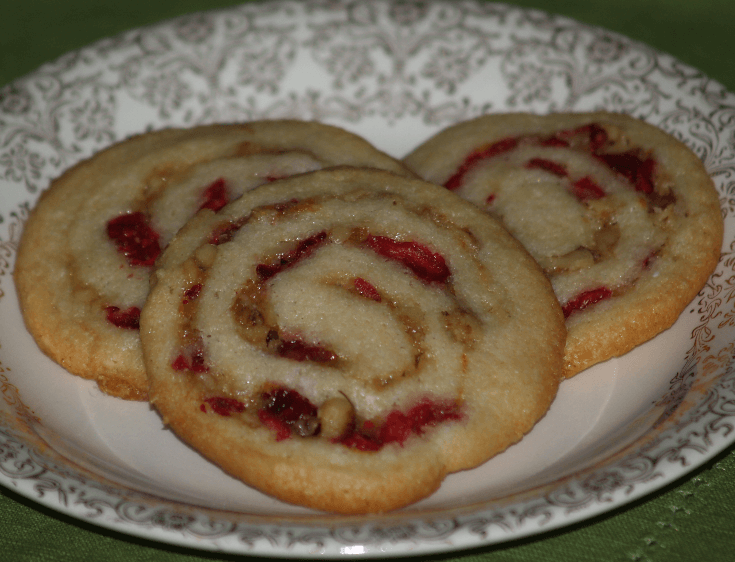 Learn how to make slice cookies with cranberry nut swirls. Beat butter on medium speed of mixture until creamy. Gradually add ¾ cup sugar beating well; beat in egg and vanilla. Combine flour, baking powder and salt; gradually add to butter mixture. Shape dough into a ball; cover and chill at least 2 hours. Roll dough into a 10 inch square on floured wax paper. 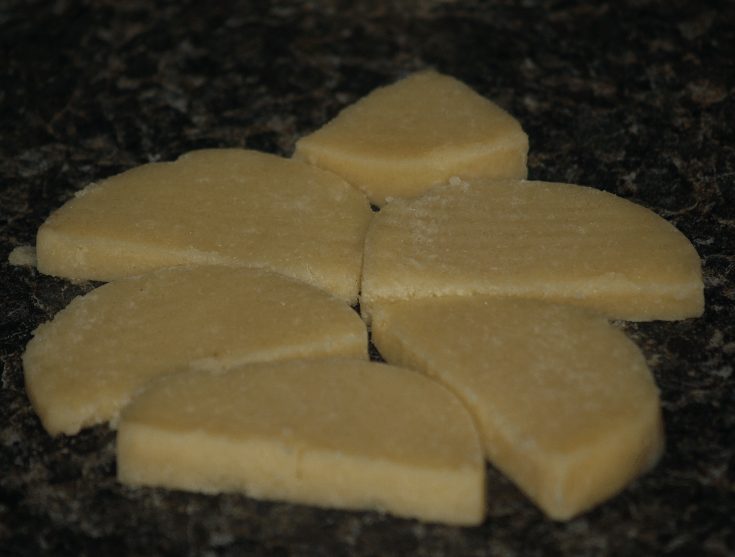 Combine brown sugar and milk; spread evenly over square to within ½ inch of edges. Combine cranberries, walnuts and orange rind; spread evenly over brown sugar mixture. Roll up dough peeling wax paper from dough while rolling; pinch edges to seal. Wrap roll in wax paper and freeze until firm. 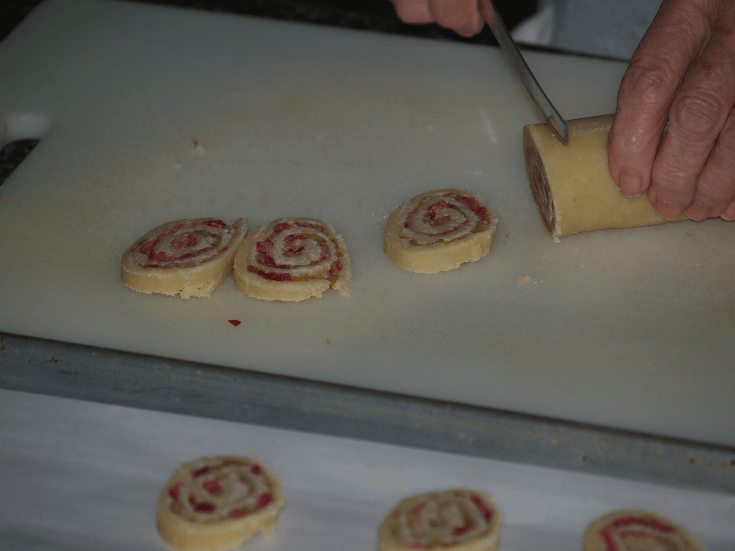 Unwrap roll and cut into ¼ inch slices; place 2 inches apart on lightly greased baking sheet. Bake 12 minutes until lightly browned; remove to rack for cooling; makes about 3 dozen cookies. Cream butter and sugar; beat in egg yolks. Blend in flour and black walnuts (Save the 2 tablespoons). Shape the dough into a log 2 ½ inches in diameter and 12 inches long. Wrap log in foil; refrigerate overnight. Cut in slices 1/8 to ¼ inch thickness; place on ungreased cookie sheets. Bake 7 to 10 minutes; cool completely on rack and frost. Makes 24 to 26 cookies. Combine all ingredients except black walnuts; beat in enough water for spreading consistency. Stir in reserved nuts; spread on tops of cookies.